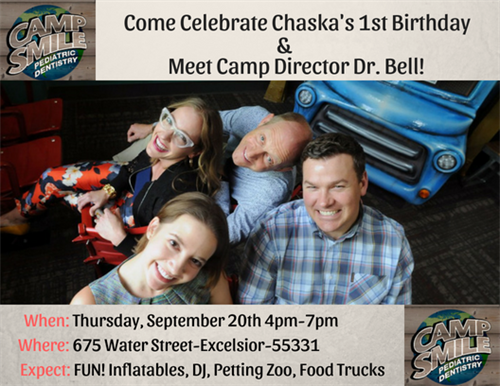 Camp Smile Pediatric Dentistry will be holding an open hosue to celebrate the one year anniversary of our Chaska location and to welcome Dr. Katherine Bell to our team! This is a family friendly event open to all in the community and is free of charge. We will have inflatables, a child friendly DJ, a petting zoo, an ice cream truck, and a food truck. Please come and bring your friends to help us celebrate! Thursday, September 20th from 4pm to 7pm.